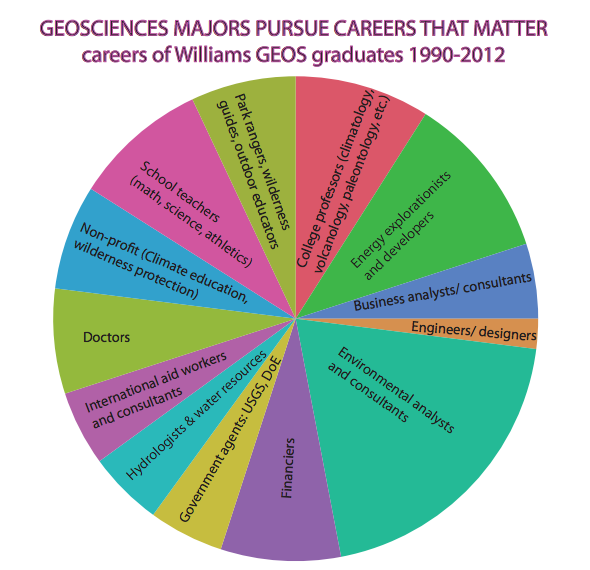 What have Williams Alumni done with their Geoscience Major? Williams has traditionally ranked highly among colleges in the number of undergraduate geology majors who eventually received their Ph.D. degree in geology. From 1992-2012, our graduates have received 11 NSF Fellowships, 4 Fulbright Scholarships, 2 GSA Young-Scientist awards, 1 European Union Young Scientist award, and 3 AGU Fellowships. Our majors have also gone on to careers in medicine, law and investment banking, but with a solid foundation in critical and analytical thinking and a deep appreciation for our home planet.